Shivshahi bus booking for all passengers has been started with the help of MSRTC team. MSRTC online bus booking is popular among the passengers for its timely service, easy booking, good services, nice user experience etc. Shivshahi bus getting attention from passengers because of its services and cleanliness. 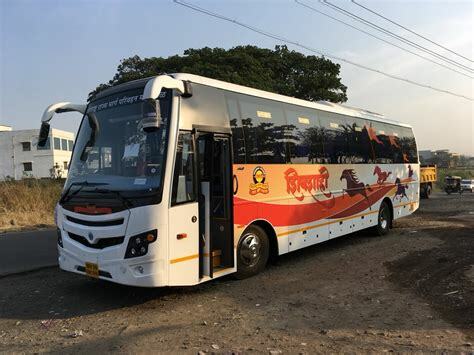 Shivshahi bus is the semi luxury MSRTC bus. as you know the MSRTC means trust and good services in economical fare ticket. Since 1960 MSRTC serving to all its passengers without any hiccup. choose shivshahi bus booking for online ticket booking. Why you should choose MSRTC buses? Well, Dear friends . The most important aspects in any journey is safety. there is no matter how good traveling experience was, but journey should be safer and hassle free. MSRTC comes first in all terms of safety and security because MSRTC maintained its track record very clean and transparent. There no region/ taluka, place where state transport buses doesn’t exist. All over Maharashtra state MSRTC made very strong bus network from village to all its metro cities like Mumbai and Pune. MSRTC even have buses which goes outside Maharashtra like Gujarat,Madhya pradesh, Karnataka, Goa etc. Now lets discuss about the ticket price of MSRTC buses like shivshahi bus, shivneri bus, hirkani bus etc. Shivshahi bus is the semi luxury bus where as shivneri is fully luxury bus and hirkani is non AC bus. When we compare to bus tickets of all these 3 type of buses. Shivshahi bus = Shivshahi bus ticket is lower as compare to shivneri bus but little bit higher than Hirkani bus. Hirkani bus/ parivahan bus = The ticket price of these buses very economical. Please don’t share your ATM pin or ATM card number to anyone, if someone ask you to provide please don’t give such information even not to bank employee.